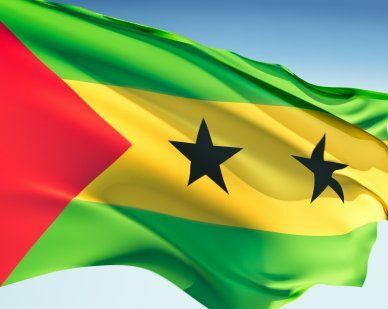 Featuring the pan-African colors of red, yellow and green, which symbolize African independence and unity, the flag of Sao Tome and Principe was adopted in 1975 following the nation's independence from Portugal. The red stripes symbolize the blood shed during the nation's fight for independence. Green stands for the vegetation of Sao Tome and Principe and yellow signifies the sun and the country's cocoa industry. The color of the stars is for the African people; while the stars symbolize Sao Tome and Principe. Our top-quality Sao Tome Principe flags conform to all official specifications. Emblems and designs are executed with the highest possible degree of accuracy in regard to detail, color shades, placement and proportion to flag size.